It is no wonder many directors choose Scotland as a backdrop for their films: the green hills, clear lochs and fairytale castles seem straight out of a movie set. If you are looking to do something slightly different during your holiday, it could be a good idea to visit the places where your favourite actors have walked. Here is a list of the most famous movies and TV shows filmed in Central Scotland. Doune Castle. This picturesque medieval stronghold was the very own Castle Leoch where Claire started her journey in the past. 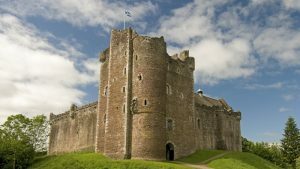 The castle’s walls are soaked in history and the audio tours available will make your visit well worth it (some of them are narrated by Sam Heughan himself). Deanston Distillery. Located only a few minutes’ drive from Doune Castle, this distillery was used on the first episode of season 2 as the warehouse in the port of Le Havre. Several tours are available here, and if all of that sightseeing dried your mouth you will be able to refresh it with samples of their own whiskey. Finnich Glen. Remember when Claire drinks from St. Ninian’s Spring (the Liar’s Spring), proving her honesty to Dougal? With its dark water and mossy walls, this glen is very popular among photographers. Loch Katrine. Loch Katrine appears briefly in episode 13 of season 2, when Brianna and Roger spend time together. This beautiful, slightly hidden spot, is famous for its Sir Walter Scott steamship, which takes you on a 2-hour scenic tour around the Loch. Other locations you might recognise are: Linlithgow Palace, where some of the scenes from Wentworth Prison were filmed; Glasgow Cathedral, which was used as L’Hôpital des Anges in season 2; Drummond Gardens, in Perthshire, which stood in for the park and orchard of the Palace of Versailles. This classic historic comedy was filmed almost entirely on location in Scotland, with Doune Castle being the protagonist and standing in for almost every castle in the movie. Just a few months ago we covered this, and all of the other filming locations used for the movie, in a separate blog post. You can read all about it here. Drummond Gardens. The same location used by the Outlander crew was also used as the home of the Marquis of Montrose. 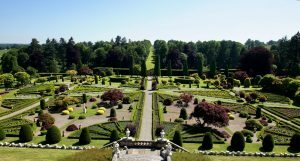 The gardens, originally laid out in 1630 by John Drummond, are one of the finest examples of formal gardens in Scotland. The Castle is a private property to this day, but the gardens are open to the public and are definitely worth a visit, especially during spring/summer. Megginch Castle Gardens. The courtyard of this 15th century castle was used as the village square. The property is open to visitors all year round, but only by appointment. Crichton Castle, a short drive from Edinburgh, was used as the “gambling den” where Rob Roy faces Cunningham. This lordly residence hosted some very influential figures over the centuries and it is now open to visitors daily from April to September. The producers of the show of the decade seem to have abandoned Scotland as a filming location after the pilot episode. But everyone remembers the iconic opening scenes at Winterfell, when the Starks were introduced. Well, once more Doune Castle played its part by standing in for the original Winterfell residence. Every year thousands of fans of the world’s most famous little wizard travel to Scotland to visit the magical locations shown in the films. If you are up for a day trip, many of the iconic landscapes familiar to Potterheads can be reached in under two hours by car. Lochaber is your destination: in one day you will be able to see Dumbledore’s resting place (Eilean na Moine), Hogwarts Lake (Loch Morar) and of course the Glenfinnan Viaduct, where the Hogwarts Express rode every year to take little wizards and witches to school. If you wish to experience this fantastic journey first hand, you can book your trip on ‘The Jacobite’ steam train through their website.